VoIP for the iPhone: Viber has come back to the AppStore. 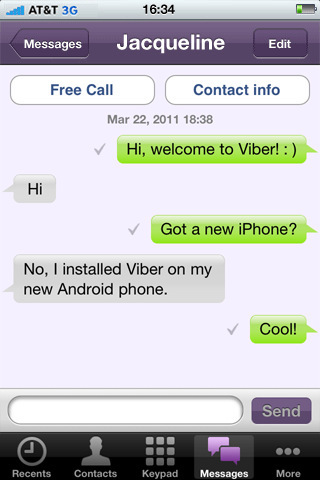 Viber, an amazing VoIP app for the iPhone simply disappeared for a couple of days from the App Store. Officially, it was said that the Viber 2.0 version had to be removed due to technical reasons. It is not a surprise that some app gets removed from the App Store due to technical issues, which are often security issues. However, it is uncommon that they come back. Normally they get banned for ever. Fortunately, this was not the case of Viper, which came back after some days away. Viber is a VoIP app on steroids. It works through your 3G or WLAN connection, which means, it’s free to use. The app itself is also free of cost to download, so there is no reason why you shouldn’t have it installed yet. Getting a VoIP running on a smartphone is no easy task. Smartphones, even the likes of the new iPhone 4, have very limited resources. On the top of that, the 3G net is also very limited, compared to standard home Internet. Compressing and decompressing data on the flow, and not making the sound quality any bit lower is the task where engineers had to put some efforts until they come up with Viber. This last point is the most astounding improvement. You can send and receive as many SMSs as you wish, for free. It is also one of the most expected features, and one of the best advertisements for Viber, which is set to take the iOS market by storm. Another advantage, already present in previous versions, is that you don’t have to create any account no where to use Viber. You just install it and it uses your phone number as your user ID. At the moment, Viber is only available for iOS devices, but it certainly a must have app. Just look at your phone bill and make the math about how much you would have saved using Viber. It is no surprise that 10 million users have already downloaded it. Don’t make any iPhone to iPhone call before making sure that the recipient is a Viber user. Get Viber Voip App for iPhone and begin your Free Phone Calls now for Free here.